John L. Hinners came to Pekin from Chicago in 1879 to build organs. Mr. Hinners named his new business the Perfection Organ Works. The original organs were built by Hinners and one assistant. In 1881, Mr. Hinners took on a partner and the business became the Hinners & Fink Company. Ubbo Albertsen came to America from Germany when he was eleven years old. As a young man, he painted wagons for the Teis Smith Wagon Works in Pekin. In 1885, after Mr. Albertsen bought out John Hinners' other partners, the business became the Hinners & Albertsen Organ Company. The company sold directly from the factory, at wholesale prices, to private purchasers. Hinners & Albertsen built everything from small parlor reed organs to huge church and theater pipe organs. Pianos were also manufactured by the business. The Hinners & Albertsen Organ Company grew to become an important part of the Pekin business community. The factory became recognized as one of the country's best quality organ and piano manufacturers. 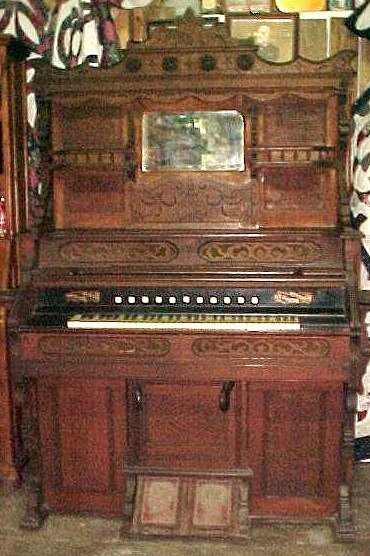 The hand-crafted organs, prized as much for their beautiful wood cabinetry as their excellent tone, were sold all over the United States and Europe. Everything was first class, from the selection and preparation of quality hardwood, right through the installation of the instrument, which was always done by a factory representative. Unfortunately, this hand-crafted excellence would ultimately spell disaster for the company. The arrival of automation and mass production soon made it difficult for Hinners & Albertsen to compete financially. The company stayed in business until about 1940 but most production ceased in the late 1920's. The last 10 years or so were spent just repairing instruments and replacing parts. The Hinners & Albertsen Organ Company factory building at 125-131 Court Street no longer exists. The site is now a small city park near the riverfront (Illinois River). 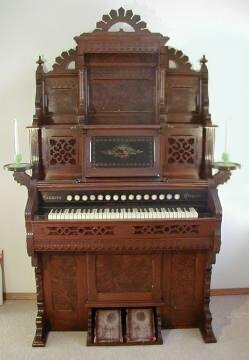 Today a Hinners organ is still considered a prize possession of many churches and antique collectors. We do have a few pictures and ads in our collection. We also have a small parlor organ in storage that will someday be placed in a county museum currently under development.